Adelaide Broadsheet: Stereo Aids - Manufacturers of Mirror and Pocket Stereoscopes. Publishers of 3D Imagery. 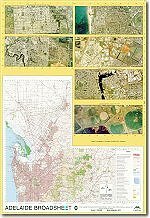 1:150,000 topographic map of the Adelaide metro area. Six 1:20,000 aerial photo extracts. 6 photos of Adelaide suburbs. 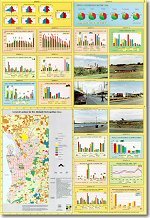 Map of general landuse of Adelaide Metro Area. 5 sets of questions and exercises.